15 April 2019: an updated, v1.2.0 release of the bootable image is now available, which ships with a 64-bit Debian Buster guest; please see here for further details. but still need to run a few (possibly GUI-based) 64-bit-only packages on their RPi3. As my current Gentoo image is not such a great fit for those particular requirements (source-centric Portage pms, OpenRC init, Xfce4, etc. ^-^), over the last couple of weeks I've been putting together — as a proof-of-concept really — the sort of system I'd like to be able to point such users towards when they ask. Note: the question here is not whether people really need the capability to run 64-bit software on their RPi3; perhaps many don't, but enough genuinely do (mongodb-3.2 users etc.) that I've chosen to run with it in what follows. A 64-bit (aarch64) Debian Stretch userspace guest OS booted inside a lightweight systemd-nspawn container (to provide an easy, safe and familiar 64-bit playground, without going all the way down the KVM wormhole ^-^). have access to the pi user's home directory. Due to the containerization , such apps are however prevented from performing many harmful actions on the host (whilst still running in a fully-featured, booted OS instance with its own systemd, dbus etc. ; this is not just a chroot). Package management in the guest uses the familiar apt-get, with the full Debian aarch64 repository available, and day-to-day Raspbian operation (with the exception of anything needing e.g. MMAL or OpenMAX IL) is pretty much per the stock image. WiFi, Bluetooth, I2C etc. all work, and 32-bit Raspbian apps can be installed and used just as on a regular RPi3 system. As of today, I've released this as a bootable image on GitHub, here. You can burn the image (~925MiB compressed) to a microSD card (>=8GB), then boot your RPi3 from it directly (the root partition will be automatically resized to fill the card on first boot, per the standard Raspbian flow). Full instructions for download and use are provided on the project's GitHub page. 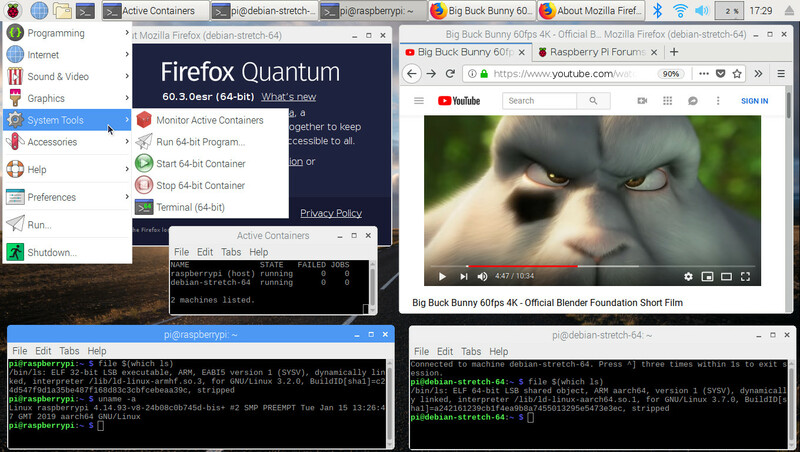 64-bit Firefox-ESR (as shown in the above screenshot) is pre-installed on the 64-bit guest (and may be launched from the Internet menu in Raspbian), as proof that full-scale 64-bit apps can usefully be deployed on this kind of hybrid system. I've also posted a tutorial covering how to create such an image step-by-step, here. Shorthand for the trinity of namespacing, seccomp-bpf and capabilities, the common kernel facilities leveraged by "concessionaire" apps like systemd-nspawn, firejail and docker (of course, other facilities such as cgroups are also used). Last edited by sakaki on Mon Apr 15, 2019 5:51 pm, edited 3 times in total. This is great (as always) Sakaki, but I think there is probably an easier way to do this. You should be able to do the same from armhf Debian. It should follow then that you could use armhf raspian packages and Debian arm64 packages together with a multiarch setup. The generic Debian kernels are bootable on the pi, you just need to change the fat partition so that it is mounted as /boot/firmware and use something like flash-kernel or raspi3-firmware to copy the kernel/initrd to where it is needed. Just an idea, sorry about hijacking your thread! Yes, agreed, those users who don't mind moving away from Raspbian as their base OS, can certainly use an aarch64 distro that supports multiarch, if they wish. But then it isn't Raspbian. And of course, once you allow a distro move, then the requirement for 32-bit support also becomes, for most users to whom that would appeal, much less strong (unless you have some legacy 32-bit apps you don't want to lose, are working on an arm32 assembler project or whatever). At least that was the (maybe flawed ^-^) logic that led me to launch gentoo-on-rpi3-64bit as a 'pure' 64-bit system all those moons ago. This idea is sound, but converting Raspbian's existing packages to play nicely in a multilib environment is non-trivial. jdonald, out in front as always, has written a script to do this, here, which works by creating shadow copies of all affected debs. However in the absence of 'official' support upstream from RPF, maintenance of such a modified system (dealing with conflicts and such) is likely to be somewhat involved going forward, an unofficial mini-distro in itself. So what to do? My conclusion in the end was that running a 'sidekick' 64-bit OS in a lightweight systemd-nspawn container, appropriately 'wired in' to the audio and Xserver of the host OS, would be the most natural / lightest touch way to go, which is what the bootable image provides. This way, apart from the kernel and a little orthogonal configuration, everything in the Raspbian side remains vanilla, so users should be able to keep updating their system using the official repos without problem (and the same is true for the guest OS, which is isolated at a package level from the host). Although building such a system up from scratch (as detailed in my tutorial post here) is a little involved, those booting the raspbian-nspawn-64 image don't need to worry about any of that, since it all (should!) just work out of the box. feelslikeautumn wrote: Just an idea, sorry about hijacking your thread! Thanks for the detailed reply. I hadn't realised multiarch had already been suggested. Must of missed that in the boring 64 bit threads (that I don't read anymore). Thanks sakaki! Any bench testing results to help the uneducated on reasons to try the 64 bit bootable image on GitHub? ...Any bench testing results to help the uneducated on reasons to try the 64 bit bootable image on GitHub? It took just 5 minutes to xzcat the compressed image to a 32G µSD on Raspbian, thanks to Sakaki's excellent instructions, so why not just try it for yourself? I'm wondering why the "uneducated" need more reason to try a thing than the fact that it is there, looks interesting, and might be useful? Well done Sakaki, brillant work on the OS and the wiki, again. You don't happen to be visiting Cambridge by any chance? Works booting from some tiny Lexar 32GB USB sticks. Old Debian version but it was a start. Installing Ultibo via the install script requires the aarch64 3.0.2 FPC, which of course does not exist. Running 32 and 64 bit compilers at the same time? Need get my head around that possibility now. This Debian is reporting 13.0.6 on glxinfo, I think Gentoo64 was up to 18.2.? People forget Debian is meant to be the safe stable Linux OS, not the bleeding edge ones some of us use. This is looking very good as a useful intermediate step of having 32 and 64bit Raspbian at the same time. Sakaki calls herself a "unscary Gentoo girl"
Any bench testing results to help the uneducated on reasons to try the 64 bit bootable image on GitHub? Since the Pi's came out I had to learn a dozen plus computer languages, learning new ones has become fun. It has now come to the point of me even thinking about making my own langauge/compiler and perhaps fpga based cpu design. Great work! With this image, you get to keep all your familiar Raspbian 32-bit programs, while being able to run 64-bit Debian programs as well. This gives you the latest versions of Chromium and Firefox which aren't present in the Raspbian repositories. You get the efficiency of a 64-bit OS while sticking to a familiar, friendly OS. Well, tbh this particular image isn't so much targeted at performance improvement, as making the use of 64-bit packages possible in a 'vanilla' Raspbian environment for those who need this facility (for example, to enable the use of a modern variant of mongodb, PocketMine-MP etc., without having to change distro, even to one as self-evidently appealing as Gentoo ^-^). The Classic Benchmarks are the first programs that set standards of performance for computers in the 1970s and 1980s. They are Whetstone, Dhrystone, Linpack and Livermore Loops. Improvements indicated relate to comparisons of gcc-6 64 bit versions and 32 bit compilations from gcc 4.8 via Raspbian. Whetstone - This includes simple test loops that do not benefit from advanced instructions. There was a 40% improvement in overall performance. This was due to limited but dominant tests using such as COS and EXP functions. Dhrystone - rated in VAX MIPS AKA DMIPS produced a 43% improvement, but this benchmark is susceptible to over optimisation. Linpack - double and single precision versions (DP and SP), with results reported in MFLOPS. Speed improvements, over the 32 bit version, were around 1.9 times DP and 2.5 times SP. There is also a version that uses NEON intrinsic functions where, at 32 bits and 64 bits, are compiled as different varieties of vector instructions, with only a 10% improvement. Livermore Loops - has 24 test kernels, where 64 bit performance increased between 1.02 and 2.88 times. The official average was 34% faster, at 279 MFLOPS. This is 21 times faster than the Cray 1 supercomputer, where this benchmark confirmed the original selection. Memory tests - These measure cache and RAM speeds with results in MB/second. As could be expected, RAM speeds were generally quite similar for particular test functions. MemSpeed - Nine tests measure speeds using floating point (FP) and integer calculations. Cache based improvements were 1.64 to 2.60 DPFP, 1.17 to 1.55 SPFP and 1.03 to 1.23 integer. BusSpeed - this reads data via loops with 64 AND instructions, attempting to measure maximum data transfer speeds. It includes variable address increments to identify burst reading and to provide a means of estimating bus speeds. Main differences were on using L1 cache data, where average bursts speeds were 38% faster but reading all data was slower. This is surprising as the 64 bit disassembly indicate that far more registers were used, with fewer load instructions, and the same type of AND instructions. NeonSpeed - All floating point data is single precision. The source code carries out the same calculations using normal arithmetic and more complicated NEON intrinsic functions, the latter being compiled as different types of vector instructions, with no real average 64 bit improvement. The normal SP calculations were slightly faster. Remember, because of restrictions imposed by use of a 64-bit kernel, some things (like gpu-assisted video decoding) will be unavailable, so for for your particular use case, switching to a 64-bit-capable image may make things worse, not better. Happy to do so, at least for this Raspbian-32/Debian-64 variant! If you don't mind though, please remind me what format you require for an externally hosted PINN image (as you've kindly been doing the conversion/hosting for Gentoo64 (née gentoo-on-rpi3-64bit) on your own infrastructure)? @sakaki -I'll drop you an email with details shortly. sakaki, thanks for the bench test results from roylongbottom. I love this comparison for Livermore Loops: "This is 21 times faster than the Cray 1 supercomputer." And appreciate the note on restrictions. "This is 21 times faster than the Cray 1 supercomputer." Yep, some of us can remember when the Cray 1 came out. Now we all walk around with faster than Cray machines in our pockets. I have those Byte mags in a box somewhere. Is that a hint from my administrator? Too hard to break, might have to go back to normal Raspbian. Wonder if those FPGA tools will install easier? Copy the aarch64 RISC-V tools across? I should be able to push it over the edge some how? So far it looks like a minimal aarch64 with normal Raspbian aarch32. Yep just another Sakaki magic trick, more wiki time. Going to be interesting if I can get an aarch64 and aarch32 gcc compiler going. Need LLVM first, perhaps start with just the baremetal RISC-V compilers? Based on feedback received, I'm going to add a service to ensure that if (regular) users are added to 32-bit Raspbian they are automatically reflected inside the 64-bit Debian container, and similarly that changes to the password for regular users in the host are automatically reflected inside the container. And I'm also going to make the whole of /home bind-mounted into the container. This should enable app and shell launching within the 64-bit container for all regular users, not just "pi". When this is done and tested I'll re-release and also put up a version (hopefully) suitable for PINN (thanks for sending through the instructions for image conversion btw @procount). Any other requests for changes to raspbian-nspawn-64, please post them here or email them to me (sakaki@deciban.com) by end-of-day Monday 4th Feb, when I will lock off a new version for testing. Release should then follow a week or so after that. From personal experience, adding Debian repositories to a Raspbian system and installing packages and upgrading from them can cause incompatibilities and can even break your Raspbian installation, giving you no other option but to reinstall Raspbian from scratch. And the generic kernel isn't even optimised for the Raspberry Pi 3 so you will face some issues while using the generic kernel on the Pi. Best bet is to use a chroot or container and an ARM64 kernel like sakaki's image does. Or, you could use a pure 64-bit system and then run Raspbian in a chroot. Great work sakaki. I like how you take inspiration from various proofs of concept and carefully consider user feedback to come up with something awesome. Looking at jdonald's scripts the problem seems to come from different mesa versions. Rather than hacking the control files, I wonder if recompiling the mesa package would fix things? The Mesa patch version is just one minor detail. The main mechanism of that family of scripts is to hide the +rpi version suffixes and mismatching changelog files. code_exec and sakaki are correct that this does not result in a maintainable system. It's effectively only useful if a) you're setting up a multiarch demo system where in the future you never intend to upgrade or install new packages; or b) will get some 64-bit work done then later revert via the included undo.sh script. 1) First thing that comes to mind is that it would be nice to have a binfmt registered such that aarch64 programs executed from the default shell automatically spawn inside the container. This is inspired by some Wine+qemu guides for Raspbian that similarly try to make a more seamless experience launching guest applications. 2) Share /usr/share/applications between the host and the guest so that programs installed on the guest automatically appear in the PIXEL start menu. 3) bcm2835-unicam doesn't appear to be present in the kernel modules despite the version being 4.14.93+. Could it be included? This request is not too specific to this systemd-nspawn image. Rather, all 64-bit Pi systems could address one major shortcoming by making it possible to access the SoC camera. Is that going to be in 4.19? When 4.19 comes out it might be easier? Probably only a few months away as RPT guys already have versions they and others are debugging. Mind you if Sakaki knows how to do it she probably won't be able to resist. sakaki has a GitHub repository where she provides a frequently updated 64-bit kernel for the Raspberry Pi 3. If you want to update your kernel, you should update it from that repository. code_exec, you might not have noticed but currently I probably the noisest in the Gentoo posts. Even her B2/B3 and Gentoo forum posts, all very educational and well written, I'm learnng lots. That's an interesting idea! But, how does the 32-bit shell user even get to the point of trying to invoke a 64-bit app in the first place (in order for the binfmt handler to then pick it up)? Would you propose they be navigating inside the /var/lib/machines/debian-stretch-64 folder? Or would you propose adding e.g. /var/lib/machines/debian-stretch-64/usr/bin etc. into the 32-bit PATH? Could you share some links to the Wine/QEMU guides you mentioned, so I can get a better idea? Thanks! Applications in the 64-bit guest need a little manipulation to be launched via the host GUI. Specifically, the Exec entries in their .desktop files need to be prefixed by ds64-run or ds64-runner (an appropriate-environment systemd-run invocation, essentially). This example shows how firefox-esr (64-bit) is invoked from the host's "Internet" desktop menu on the current image. Also pixmaps used in the guest's .desktop files need to be path-visible on the host too. But, in principle something like this could be done (would be quite neat!) - perhaps via a systemd path unit watching the appropriate directories in the container's filesystem and automatically creating / removing 'shadow' .desktop files on the host. I'll have a look - maybe not for the next release though. (Of course, if the PATH were augmented as per point 1 then maybe this could all happen automagically via binfmt_misc, provided no absolute paths are in the guest's destkop files of course). OK. I actually have two weekly 4.14 autobuild kernel projects for the RPi3. The first, bcmrpi3-kernel, is a vanilla bcmrpi3_defconfig build (so that won't change config unless upstream does), but the second (which is actually used in the raspbian-nspawn-64 image) is bcmrpi3-kernel-bis, and that contains a number of tweaks to bcmrpi3_defconfig (to enable KVM etc). No reason why the camera module couldn't be enabled in the latter (and that'll make it work for other consumers of this kernel too, such as gentoo-on-rpi3-64bit), so I'll look to do this for the next release. (I've also got a 4.19 autobuild, but that's currently a private repo; will be rolling it out once the USB issues get sorted on 64-bit). AFAICT The USB issues will be present on ALL 64 bit kernels - it's not something that only affects 4.19. If someone would confirm that then it would be a useful data point. I'm just creating the PRs to enable all the extra modules for camera drivers etc in bcmrpi3-defconfig. Looking at your bcmrpi3-kernel-bis diffs, it is curious that CONFIG_IPVLAN is missing from bcmrpi3_defconfig when it's in the 32bit configs, so I'll tuck that one in as well.